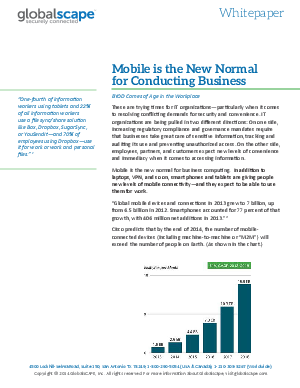 Mobile devices have offered organizations unparalleled access to information and a new level of flexibility in doing business. However, with this newfound freedom comes inherent risks and the danger of security breaches. This whitepaper discusses the growth of mobile devices in the workplace, inherent security issues in common file sharing services, and what organizations can do to enforce BYOD security policies without limiting the productivity of its employees.